Fresh off their win over Oregon State, the Stanford Cardinal went into a tough environment in rainy Eugene, Oregon to take on the #2 ranked Oregon Ducks. The winner of the game would take the lead in the Pac-12 North and a possible matchup with UCLA in the Pac-12 Championship Game. Stanford has one of the best defenses in the country, but not many people thought the Cardinal could shut down the Ducks offense quite like they did. Up to this point, the Ducks were averaging over 54 points per game and no team had held them to less than 42 points. The sloppy conditions probably had a little to do with it, but you can’t minimize the effort of the Cardinal defense. They swarmed to the ball all night long and the Stanford front seven dominated the Ducks. Stanford dodged their first bullet of the night midway through the 1st quarter. After a punt had pinned the Ducks at their own 8 yard line, Oregon freshman QB Marcus Mariota showed why he was named the Ducks starter by racing 77 yards down the right sideline. The Ducks were setup with a 1st and 10 at the Cardinal 15, but on 4th and 2, Mariota was stopped for no gain by linebacker Shayne Skov. The stop invigorated the Stanford offense and they responded by driving 93 yards for a touchdown, ending on a 1 yard run by freshman quarterback Kevin Hogan. The drive lasted for 15 plays and took 7:01 off the clock. Midway through the 2nd quarter, the Ducks got some momentum and behind the rushing of sophomore running back De’Anthony Thomas, moved the ball to the Stanford 38 yard line, but once again Oregon coach Chip Kelly decided to go for it on 4th down and Mariota’s pass to tight end Colt Lyerla fell incomplete. Stanford took over and drove the ball to the Duck’s 41 yard line. Facing a 4th and 1, they decided to go for it. The Cardinal came up with the perfect play with Hogan faking the ball to the back and then throwing to fullback Ryan Hewitt, who had slipped behind coverage, but the throw was off target and the ball fell incomplete. When you play the Ducks, you have to be ready for the surges. When Oregon gets hot, they points come fast and quick. After the 4th down stop, the Ducks struck needing only 0:47 to tie the game. Mariota completed two passes of more than 20 yards sandwiched around a Kenjon Barner run. The last pass (only the 3rd play of the drive) was a 28 yard TD to sophomore receiver Keanon Lowe. With 3:26 left in the 1st half, the score was surprisingly only 7-7. The half ended with the score still tied and both teams threatening, but turning the ball over. Midway through the 3rd quarter, the Ducks took the lead 14-7 on a 16 play, 95 yard drive. The drive was a mix of 6 rushes and 10 passes with De’Anthony Thomas running the ball in from 6 yards out. The Ducks quick paced offense tends to wear teams down and it’s usually at this point that defenses get tired and the avalanche of Oregon points takes over. It looked like it would happen here when Stanford running back Kelsey Young fumbled on the very next play and Oregon corner Ifo Ekpre-Olomu recovered at the Stanford 39 yard line. The Cardinal defense, however, continued to fight and forced a 4th down at the Stanford 25 yard line. Kelly sent out the field goal team, but the 42 yard field goal missed and the score stayed at 14-7. The Cardinal defense continued to scratch and claw and limit the Ducks scoring opportunities. The offense, however, continued to shoot itself in the foot. Late in the 3rd quarter, the Cardinal threatened, but Stepfan Taylor fumbled and Ekpre-Olomu recovered his second fumble of the day. Early in the 4th quarter, Stanford again threatened, but missed a 43 yard field goal. With only 6:28 left in the game, the Cardinal offense finally got on track. By mixing the run with passes to tight end Zach Ertz, Stanford moved 78 yards in 11 plays, culminating with a 10 yard pass from Hogan to Ertz. The score tied the game at 14 with only 1:35 left. The Cardinal defense once again stopped the Ducks and regulation ended with the score tied at 14. Stanford won the coin flip to start overtime and elected to play defense first. The choice proved to be the right one with Oregon going 3 and out. They attempted a 41 yard field goal, but the ball hit the upright and bounced away. All the Cardinal had to do was score and the game was over. Stanford conservatively ran 3 rushing plays then sent out the field goal unit. Jordan Williamson connected on a 37 yard field goal and Stanford’s upset attempt was successful, winning 17-14. This win can be chalked up to the Stanford defense. They kept the game close and kept their team within striking distance the entire game. They are the first defense that has held the Ducks under 42 points this year and to hold them to 14 is a major accomplishment. The Cardinal has a very good front seven, but many people wondered if the secondary could keep up with the Ducks speed. The defense did a good job for the most part stopping the Oregon running game and kept Ducks from going on scoring sprees that normally bury the Ducks’ opponents. They also contained Ducks running backs Kenjon Barner and De’Anthony Thomas who normally run wild through most defenses. The Cardinal offense actually outgained the Ducks offense (411-405), which is a first for 2012. The game ended what was a crazy day of football. At the same time that Stanford was knocking off the #2 team in the country, the Baylor Bears were knocking off the #1 ranked Kansas State Wildcats. With the top two teams losing, the Notre Dame Fighting Irish took over the #1 ranking in the polls and only need to beat a USC team without quarterback Matt Barkley to go into the BCS Championship Game. The real surprise is the #2 team. After losing to Texas A&M a week earlier, the former #1 ranked Alabama Crimson Tide made it back into the top two. They will need to beat Auburn and likely Georgia the SEC Championship game to make it to the BCS Championship Game for the second year in a row. Stepfan Taylor-RB-Jr: Stepfan Taylor continues to impress in the Stanford rushing game. He has a very strong lower body and his wide rushing stance allows him to pick and choose his holes and churn through the defense. He has good pad level and doesn’t hesitate running over defenders. His vision and power allow him to attack small creases and get positive yards. Once he makes contact, he keeps his feet moving and finishes the run well. Taylor normally takes very good care of the ball, but he has fumbles in the last two games. Against the Ducks, he carried the offense, gaining 161 yards on 33 attempts. He also had 1 catch for 4 yards. 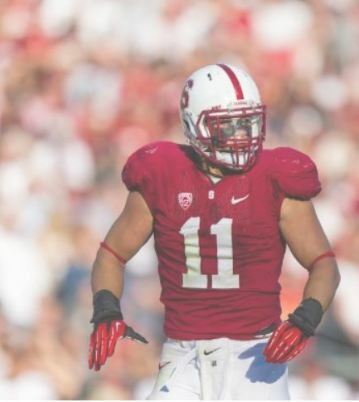 Ryan Hewitt-FB-Sr: Ryan Hewitt has become a very valuable component of the Stanford offense. He does a lot of the dirty work that allows them to move the chains. He opens the way for the running back on their power run plays but he’s also a great safety valve in the passing game. The young quarterback has meshed well with him and looks for him on designed bootlegs. Hewitt is also a good short yardage runner that runs behind his pads and inflicts pain on the tackler. Against Oregon he had 2 carries for 5 yards and 2 catches for 14 yards. One of his rushes converted a 4th and short situation. Zach Ertz-TE-Jr: Zach Ertz is a big, dependable receiver that has become the go to receiver. At 6’6” he provides the young quarterback with a big target. He can even go down and get low balls. Ertz has good footwork and does a good job keeping his feet in on sideline balls. He comes back to the ball while it’s in the air. Ertz is a strong player that breaks tackles once he makes the catch. Against the Ducks he had 11 catches for 106 yards and had an amazing touchdown catch to tie the game and send it to overtime. Levine Toilolo-TE-Jr: Levine Toilolo is a big, tall target. He is a beast in the red zone, but he has had some drops this year and needs to work on his concentration. His 6’8” size makes him hard to defend and he creates mismatches against smaller defensive backs. Against Oregon he had 3 catches for 17 yards. Kevin Danser-G-Jr: The key to the Stanford offense is the running game, primarily between the tackles. Danser is one of the linemen that makes that inside running game go. He is a tough player that moves his man off the ball. He also has a good, short pass blocking stance and he protects the A gap well. Danser was injured against Oregon, but he later returned. He needs to clean up his game a little bit as he was flagged for a hold and a chop block. Kalil Wilkes-G-Jr: Kalil is another of the key interior linemen for Stanford. He gives great effort and has good football sense. He saved the game for Oregon during overtime when he recovered a Kevin Hogan fumble that allowed the Cardinal to hold on to the ball and kick the winning field goal. Terrence Stephens-NT-Sr: Terrence Stephens is a big, strong nose tackle. He can tie up blockers and push them back into the backfield. Stephens’ presence allows the linebackers to flow to the ball and make plays. His impact to the defense doesn’t always show up on the stats page, but he is an important piece of the puzzle. Against Oregon he had 1 tackle. Ben Gardner-DE-Jr: Ben Gardner plays good containment, keeping the runner from getting outside of him. He gets off blocks well and makes plays. Against the Ducks he had 2 tackles and 1 tackle for loss. His experience playing as a 5 technique in a 3-4 will make him a valuable commodity for NFL teams. Henry Anderson-DE-Jr: Henry Anderson is part of a rotation at defensive end for the Cardinal. He is athletic and gives relentless pursuit. He had a very good game against the Ducks with 6 tackles and 1 ½ tackles for loss. Anderson also back to back big plays, making a 3rd down stop short of the sticks then forcing a bad throw on 4th down. Chase Thomas-OLB-Sr: Chase Thomas has good athleticism and uses very good technique. His inside out approach keeps players from turning the corner against him. Against Oregon he had 3 tackles. Trent Murphy-OLB-Jr: Trent Murphy teams with Thomas to give the Cardinal a potent 1-2 punch on the outside. He is very athletic and is a relentless pass rusher. He has good speed and does a good job chasing down the ball carrier. Against Oregon he had 3 tackles, 1 tackle for loss, 1 sack and dropped an interception. Alex Debniak-OLB-Sr: Alex Debniak is part of the rotation at outside linebacker to keep players fresh. He does a good job getting after the quarterback. Against the Ducks he had 1 tackle and his pressure forced a bad throw in the red zone. Shayne Skov-ILB-Sr: Shayne Skov is starting to play like he did before his knee injury from last year. He does a good job reading, reacting and stuffing the runner. Skov clogs the middle of the Stanford defense. He makes plays all over the field and tackles well in space. Skov had one his better games of the year against the Ducks with 10 tackles and 1 tackle for loss. He made a big play stopping Mariota on 4th down in the red zone. A.J. Tarpley-ILB-Jr: A.J. Tarpley is a playmaker for the Stanford defense. He is always around the ball and makes an impact in several phases of the defensive game plan. Tarpley chases the ball sideline to sideline and uses good tackling technique. He is an aggressive player that isn’t afraid to take on blockers. Against Oregon he had 5 tackles, 1 tackle for loss, 1 pass break up and an interception just before halftime. Terrence Brown-CB-Jr: Terrence Brown plays good tight man coverage. He is aggressive in coverage and also is good in run support. Brown recovers well while the ball is in the air and uses good technique. Against the Ducks he had 5 tackles and broke up 2 passes. Ed Reynolds-S-Jr: Ed Reynolds is a ball hawking free safety. He leads the team with 5 interceptions. Against Oregon he had 6 tackles and was called for a pass interference penalty. Devon Carrington-S-Jr: Devon Carrington made a big play early in the game, forcing Mariota out of bounds on his 77 yard run. Saving the touchdown was big since the Stanford defense was able to get a turnover on downs to keep points off the board. Kenjon Barner-RB-Sr: Kenjon Barner was in the Heisman talk prior to this game, but Stanford did a good job containing him. The Cardinal held him to only 66 yards rushing on 21 carries and he had 1 catch for 13 yards. Barner makes a living hitting the hole quickly and using his explosive burst to get by defenders, but the Cardinal did a good job keeping him in front of them. Josh Huff-WR-Jr: Josh Huff has good speed and catches the ball away from his body. He gets good yardage after the catch and follows blocks well. Against Stanford he had 4 catches for 50 yards. Huff also had a silly personal foul on a punt that backed his team up inside their own 10 yard line. Dion Jordan-DE-Sr: Dion Jordan led the Ducks last year with 7 ½ sacks and he has 5 this year. He is their best pass rusher. Jordan makes plays behind the line of scrimmage. He missed the Cal game with a shoulder injury and still seemed to be bothered by it. Against the Cardinal he had 6 tackles and 2 tackles for loss. Boseko Lokombo-OLB-Jr: Boseko Lokombo is in his first year as a starter. He has good speed and does a good job rushing the passer. He has a good spin move that makes him hard to block. Against Stanford he had a season high 8 tackles, 1 tackle for loss and 1 sack. Willie Clay-MLB-Sr: Willie Clay is an active instinctive linebacker. He is the glue that holds the Ducks’ defense together. Clay plays downhill in run support, but also goes sideline to sideline to make tackles. He is the Ducks leading tackler and against Stanford he had a season high 20 stops, 1 ½ tackles for loss and a QB hurry. Kiko Alonso-OLB-Sr: Kiko Alonso is a quick, athletic linebacker. He gets good penetration and makes plays in the other team’s backfield. He does a good job picking his gaps when he blitzes. Against the Cardinal he had 9 tackles, 1 tackle for loss and a forced fumble. He also used his athleticism to hurdle a blocker that was trying to pass protect against him. Brian Jackson-S-Jr: Brian Jackson does a good job in pass coverage. He has good technique and is able to separate the ball from the receiver without drawing a flag. Against Stanford he had 8 tackles and 1 pass break up. This entry was posted on November 21, 2012 by draftmaniacs in Scouting reports.